Here it is barely August and my garden has officially given up for the season. The only plants that are still producing are a few of the heirloom tomato plants, the basil, and the potatoes I have yet to dig up. This weekend I will go out and lightly till the dead and rotting vines back into the soil and set about getting the fall plantings ready. The biggest challenge this year hasn’t necessarily been the heat. It’s true that the overly warm night time temperatures slowed production, but the plants all did, eventually bear fruit. The lack of bees (remember I was supposed to have bees this year? You can thank the uber slow progress of the landscaping for that not happening) didn’t seem to slow pollination any; there were bumblebees aplenty buzzing all around. What really hurt this year was the epic number of pests. Squash bugs. Cucumber beetles. Blister beetles. Caterpillars. Cabbage moths. Slugs. You name it, we had it, and in hordes. The blister beetles took my entire wisteria vine down to nothing OVERNIGHT. Literally. One day it was there, the next, gone. So, it was a disappointing growing season, but I am not letting it get to me too much. I had enough tomatoes to make a batch of salsa. We had so many summer squash and zucchini it felt like they were never stop. The cucumbers even managed to hold their own long enough for us to put up dozens of jars of pickles. Not to mention the mini sour gherkins – those tiny little garden workhorses. They are still producing, seemingly invulnerable to the pestilence around them. I have also formulated plans to improve things for next year – that’s the silver lining of garden failures. You learn from them. Next year I’ll be buying plenty of Neem oil and organic and natural pest controls. I will have bees. 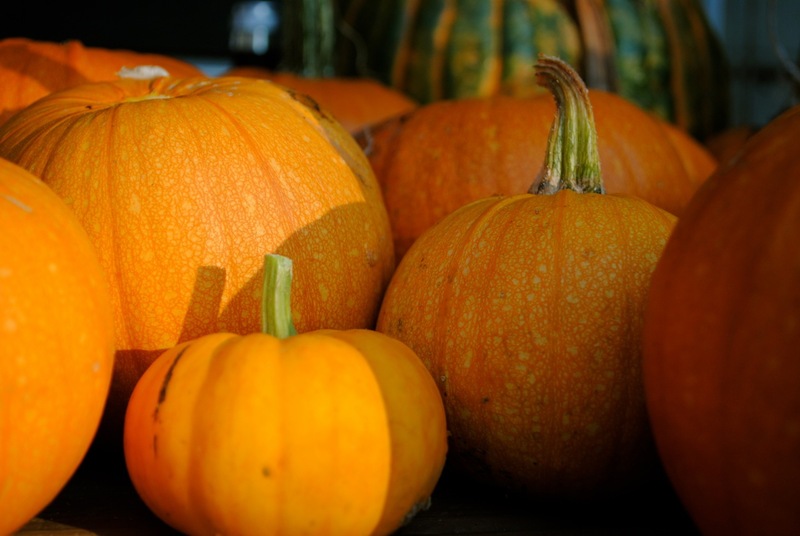 I will also move the squash and pumpkins to their own garden – they overtook everything and drowned out my peppers and watermelon, killing them off. And if I can find a way to eradicate my land of the blasted Virginia Creeper that invades everything, my beans and peas might stand a chance. All in all, if I can manage a decent fall planting (beets, cabbages, greens, a few root veg) I’ll be pretty happy. Bunches of sugar pie pumpkins, a Connecticut Field pumpkin or two, and some Jack Be Littles. 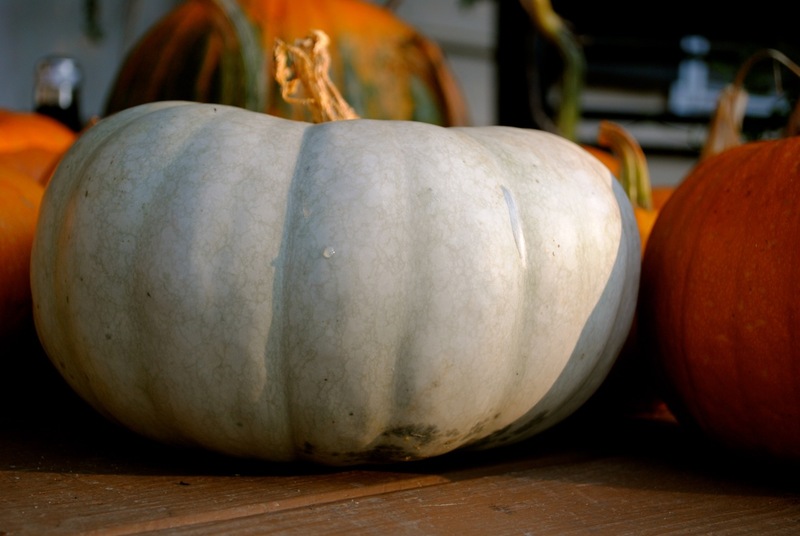 Check out this Jarrahdale Blue pumpkin! Now if the two big Musquee de Provence pumpkins would hurry up and ripen before they fall prey to the zillions of squash bugs surrounding them, I will be happy! This entry was posted in Uncategorized and tagged Farm, food, Garden, Seasons. Bookmark the permalink. Oh! I felt my heart skip several beats looking at those beautiful orbs and dreaming of fall. Then I looked at the thermometer and let out a sigh. Ah well. Still a gorgeous harvest! dude, i hear you on the pests. cabbage worms took out a lot of our early crops, then the spider mites decimated the beans and now i’m dealing with whiteflies. it’s been a rough season this year. i’m stocking up on insecticidal soap and neem oil, too.